Royal Spins Slot is a June 2017 online game release from the IGT studios. It has a royal, medieval theme. The game has 5 reels and 5 paylines, and unusually for this year’s IGT slot releases, it is a low to medium variance game. This game has already been a success in land-based casinos, so operators will be expecting it to translate successfully into the online environment. So far in 2017 we have seen video slots from IGT that are geared up for high rollers, with typically high volatility and the option to go big on your stake. But with Royal Spins, the pace is a bit more laid back – the wins come in small, but regular bite-sized chunks. The Royal Spins RTP is 95.7%. Part of the fun of this game is that paylines can form both ways – from left to right and right to left. There are also Free Spins which come with guaranteed wins on each go, and multipliers. There is also an in-built progressive jackpot that can be triggered by completing the ‘cherry’ meter at the bottom of the screen. This game is available to play on mobile, desktop or tablet and comes with both free to play and real play modes. It is available at one of our favourite casinos, Casumo Casino, where you can start now with 20 Free Spins – no deposit needed. If you want to know more about the game, read on for a detailed look at the gameplay and bonus rounds. The background to Royal Spins Slot is a medieval castle. The symbols themselves are classic fruity slot machine ones. So we have the cherries, the orange, the plumbs, the bells, and the number 7, which is the highest paying symbol, returning 200x your stake for 5 in a payline. Watch out as well for the scatter Crown Symbol, three or more of which on consecutive reels will initiate the bonus round. Players can take a Royal Spin for a stake of between 5p and £150 per spin. You can choose to bet on any number of lines between 1 and 5, and adjust your line bet to give you your stake per spin. Elsewhere you can toggle the sounds on and off as you choose. Crown Bonus Feature – Free Spins: Land 3, 4 or 5 scatters across consecutive reels to activate the Free Spins feature. 3 gets you 3 spins, 4 gets you 5 spins, and 5 gets your 10 spins. You can then earn up to another 10 Free Spins simply by landing 3 or more scatters again during the bonus round. So 20 Free Spins up for grabs in all. The exciting part of the Free Spins round is that you are GUARANTEED to win at least your stake back with every spin. Landing Crown Scatters during Free Spins will give you up to 200x your stake like this: 1 scatter symbol gives you a 2x multiplier on your stake, 3 scatters gives you a 12x multliplier on your stake, 4 scatters gives you a 48x multiplier, and 5 gives you 200x multiplier. No scatters simple gives you a 1x multiplier – effectively your money back. Cherry Bonus Feature: Every Red 7 that appears in a winning combination will increase the in-built progressive jackpot. To win this jackpot you must fill the Cherry meter at the bottom of the screen. There are 5 cherries in the meter, and each time you get a 5 of a kind Cherry win, one of the cherries lights up. Light up all 5 and the progressive is yours! This game from IGT is a safe bet for the studio to release – it’s a big success offline, and will no doubt get a big audience online too. 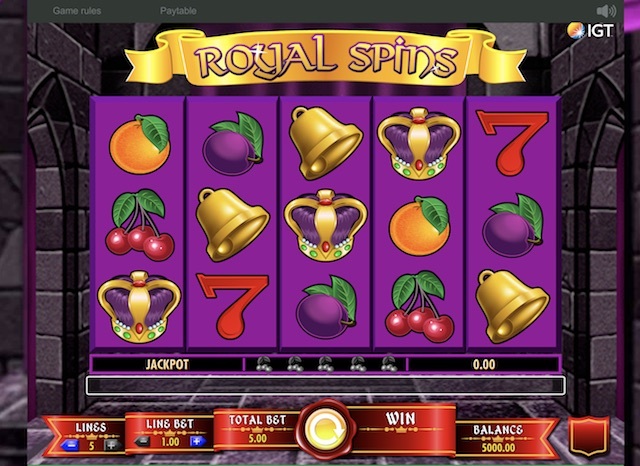 Royal Spins slot is a simple game which ticks over in the base game. The real fun comes with the Crown Bonus though, where you can really hit big wins if you are lucky with the scatters. And of course, keep your eye on that Progressive and the Cherry Meter for some big wins too.